Prior to joining us on the Eastern Shore of Maryland in the Fall of 2016, The Rt. Rev. Santosh K. Marray, 58, served as the Assistant Bishop of the Diocese of Alabama. He was Bishop Assisting of the Diocese of East Carolina 2009-2012. 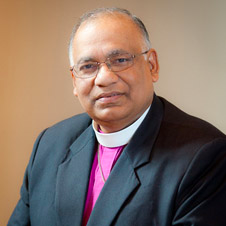 From 2005-2008 he was the Bishop of Seychelles, Province of the Indian Ocean, and led the diocese through re-imagination, change, and clergy and laity empowerment. When the diocese returned to sustainability, he returned to his family in the US. Prior to being elected bishop, he served a small parish in Florida, and multi-church parishes in his native country Guyana and the Bahamas, leading the revitalization of struggling congregations of various sizes. He has also planted new churches and carried out numerous successful capital campaigns. He taught for 10 years in the Bahamas Public School System. Marray was the Province of the Indian Ocean’s representative on the Anglican Communion Covenant Design Group and was later appointed by Archbishop Rowan Williams as Commissary to the Anglican Communion. Marray is a convert from Hinduism, the faith of his parents. His passion for Jesus and his Church is undergirded by his conviction that a loving Jesus who came looking for him in a small remote village in South America populated by majority Hindus and Muslims in Guyana deserves his love and devotion. He was ordained to the diaconate and priesthood in 1981, and bishop in 2005. He holds a degrees from Codrington Theological College, Barbados; the University of the West Indies, Barbados; General Theological Seminary, New York; the University of Wales, UK, and Colgate Rochester/Bexley Hall Divinity School. Marray is married to Nalini ‘Lynn’ since 1977. They have two grown children, Ingram and Amanda, and a granddaughter.